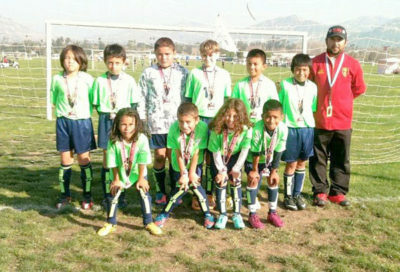 AYSO REGION 78 Hollywood-Wilshire Boys 10 and under team won a fourth place medal at the Locomotion tournament held over President’s Day weekend in Riverside. Three teams from AYSO Region 78 ( Hollywood-Wilshire) won medals over President’s Day weekend at the 19th annual Riverside Locomotion tournament, the biggest in Southern California. The Hollywood Green Lightning Girls U10 team coached by Steve Atlee and John Lanza went 5-1, earned a spot in the championship game and took home a 2nd place medal in the Express Flyer Division. The Hollywood Rangers Boys U14 team coached by Bailey Green and Jerry Neuman also earned a 2nd place medal in the Super Chief Division. The Boys U10 team coached by Manny Ramirez and Freddy Spark medaled as well, placing fourth in the Express Flyer Division.